Have you seen This Is Martin Bonner? Tell us, and read what others say. When was the last time you saw a movie that portrayed religious characters as reasonable and interesting and … well … normal? Sometimes, filmmakers show reverence to historical figures of faith — take Abraham Lincoln, for example, or Johnny Cash. But even in the Oscar-nominated films Lincoln and Walk the Line, the importance of the characters’ foundational religious beliefs was given very little attention. Most of the time, Christians at the movies are portrayed as ignorant separatists, self-righteous and judgmental antagonists, or villains who hide sinister secrets. In so-called “Christian movies,” Christians are usually idealized for the sake of selling a Gospel message — they’re shown to be either heroes who win battles in God’s name, or sinners whose climactic salvation leads to answered prayers and dreams come true. So it’s no wonder that moviegoers who discover This Is Martin Bonner end up talking about it as a rare and wonderful experience. This Is Martin Bonner tells the stories of two men. One, Travis Holloway, has just been released from prison to start his life again. Travis needs good counsel to help him find his footing in the cold and unfriendly surroundings of Reno, Nevada, and to help him reconnect with his estranged daughter. The other man is Martin Bonner, who has left behind a job as a church business manager to become a counselor who helps rehabilitate men like Travis. Both men are lonely and somewhat disconnected from their families. Both are fumbling their way into new lives. And both are struggling with questions about family, faith, and God. This might sound like the set-up for a preachy movie about finding Jesus and loving your neighbor. But it is something much more rewarding than that. It is a film of subtle power and poetic storytelling. Playing Martin and Travis, actors Paul Eenhoorn and Richmond Arquette create persuasively human and complicated characters. In its faithfulness to the nuances of ordinary human behavior and relationships, this movie offers fascinating observations about hurt, hope, and healing. It would be tempting to describe this as a movie about “ordinary people.” But This Is Martin Bonner demonstrates, by close observation, that there is no such thing as an ordinary life. We don’t necessarily need explosions, revolutions, and violence to deliver a compelling story. We just need to slow down and pay attention. Filmmaker Chad Hartigan’s career has only just begun, but he’s already earning enthusiastic reviews for his work. This Is Martin Bonner, his second feature film, won high honors at the Boston Independent Film Festival, the Florida Film Festival, the Nashville Film Festival, the Sarasota Film Festival, and Sundance. While the film did not get picked up for theatrical distribution, it is currently streaming on Netflix, and a DVD is available for purchase through Amazon. Response interviewed Hartigan just as Netflix subscribers were beginning to discover this rare and wonderful film. He talked about his particular passion for respectfully representing people with religious convictions. Hopefully, his example will influence aspiring filmmakers. Response: I’m curious about the names of your two central characters — Martin Bonner, Travis Holloway. The second name could be seen as a hint about Travis’ state of being ... he's pretty hollow, pretty empty, when we meet him. Is there any significance to the name Bonner for you? Hartigan: In the original version of the script, the character is Irish like my father. So I took the name Bonner from a famous Irish soccer played named Packie Bonner. Luckily, when I cast Paul I felt that the name could also pass for Australian. And speaking of names: Is the name Travis a nod to Taxi Driver? It’s easy to see how your Travis could become increasingly lonely and alienated, like Taxi Driver’s Travis Bickle, without Martin’s help. It's not. I am really wary of character names having meaning to the story … things like going to a movie called Poetic Justice and finding out the character's name is Justice. So I just usually open up Facebook and steal the name of the first friend that pops up in my feed or something like that. And then the beauty of a successful film is that it lends itself to observations like yours, where they can find things to mean anything. Which is why I feel, sometimes, interviews like this kind of kill the magic. I am so impressed with the quietness and unhurried pace of This Is Martin Bonner. Watching it, I thought of Tom McCarthy’s The Station Agent and The Visitor, at times. I have to assume you enjoy watching films that require that kind of patience and observation. What filmmakers' influence might we be seeing in this film? Yeah, I really do like those types of films. Some big influences on this for me were Steve McQueen’s Hunger, Tuesday After Christmas, Day Night Day Night, and The Band’s Visit. I also love Roy Andersson's work. I mean, there's so many. 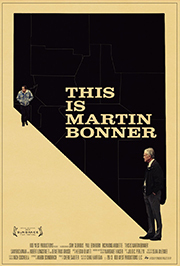 As for Tom McCarthy, people brought up The Visitor a lot when [This Is Martin Bonner] was a script, and that’s fine with me. I would never begrudge people comparing my work to other things they like. But truthfully, I’m not much of a fan of it. It’s actually the type of film I was trying to rebel against. Too many films only choose to focus on this age group if it’s to examine how wrong they've been living their life and need to rediscover the joy of youth to some extent. Even animated films like Up have that approach to the character, which I think is condescending. I wanted Martin Bonner to be a guy that has lived long enough to know what he likes to do and that's what he does and he’s as happy as he can be in his circumstances. There’s dignity to that. One aspect of Martin Bonner that I keep thinking about is … I guess I’ll call it “narrative restraint.” This story could veer suddenly into drama at any moment. Travis could turn suicidal. He could pursue the family of his victim to try and make amends. He could seek solace in drugs. And Martin Bonner could take his own sudden turns — having a hard time with another ex-con, or having a fight with his son, or having a romance. You hold back from all of this, and from so many more possibilities. And somehow, you end up telling a story unlike any I’ve seen at the movies. Tell me about your writing process. Are there certain storytelling rules you follow? Were there more dramatic drafts that you threw out? Did the story change during filming? I don’t really follow any storytelling rules. I hate books about screenwriting. They may teach you how to write good scripts but they also teach you how to write terrible movies. The adages I try to remember are things like, “The characters are the story” and “Make the story simple and the characters complex.” If you have interesting people in interesting circumstances, people will watch, I think. Michael Winterbottom has a great quote where he says, “Each scene should feel right, should be true at that moment, and gradually you accumulate these moments of truth until you get enough of them together that it becomes a story that’s interesting.” I'll watch truth on screen forever, but as soon as I see a plot mechanism at work, I check out. This story does have a couple of chapters that I kept expecting would play a larger role in the story: Travis’s encounter with a prostitute, and Martin’s involvement with a soccer team. But I was relieved, actually, that they remained almost incidental, and never felt like contrivances. They made the world feel convincingly large and believably haphazard. Still, I’m curious: Do those parts of the story speak to you about the themes and questions you’re exploring? They each mean something to me, but only in layers to character. Like shading. The auction and eBay element is one example where I actually feel that I could have, and should have, done more with it, though. It had a larger significance that doesn’t really translate, but that’s OK. It still is nice as is. You’ve talked about how, growing up as the child of missionaries, you thought all of America was like Reno, Nevada, because that’s the only American city you’d experienced. But your version of Reno seems very different than the city we usually see at the movies. I don’t think we ever see Martin or Travis enter a casino. The only suggestion of gambling is that Martin’s taking a chance at speed dating, and Travis is taking chances in meeting with his estranged daughter. Tell me about your reasons for setting the story in Reno. It’s threefold. Since my mom is from there, it was a way of incorporating elements of her into a story based on my dad. Since her family still lives there, there was a practical element of them being able to help us with rides, recommendations, etc. And I just felt that it was a thematically appropriate place. The beautiful natural landscapes mixed with urban decay, an economically depressed town that feels aged but resilient. I’m really glad you noticed the absence of casinos. It was a definite choice. I couldn't imagine any movie that would have ever shot in Reno without gambling as the main reason, and I knew from my visits and my family there that when you’re a local, gambling is a complete nonfactor in your life. Nobody does it. It’s for the tourists. So that meant there was this whole other side of Reno that had probably never been seen on film and I liked that. All that said, we would have never been allowed to, or been able to afford filming, in a casino anyway. I received some marketing material for a “Family Cut” of This Is Martin Bonner. How did that come about? Did you have any reluctance to creating an alternate cut? I did oversee an edited version for sale in Christian book stores. I wasn’t thrilled with the idea, but I was OK with the end product. I would never want anyone who doesn’t have an (in my opinion) absurd aversion to swear words to watch that version, but at the end of the day, you want it seen. I think it’s an insult to intellectual Christians to assume that they couldn’t see the forest for the trees, but it is what it is. I greatly admire the way you portray Christians with such respect. You’re not condescending or scornful. In fact, the movie doesn’t betray any kind of bias at all, except maybe a bias toward truthfulness. Did that come easy for you in crafting the film? No, it wasn't easy, but it was a definitive goal. I’m not religious myself now, but I do understand that if I’m a good person at all, it’s likely because I was brought up in an environment of love, compassion, and people living a true Christ-like lifestyle. That’s the approach I wanted to take with the film. Regardless of what you do or don’t believe, you can’t argue with good people doing good things. Making the Invisible Kingdom visible, as mentioned in the film. Are there other filmmakers or artists whose treatments of religion influence you or impress you? Not really. I'm constantly unimpressed with the treatment of religious characters in film. Even as a nonbeliever, it’s extremely offensive to me. I have a friend that records music under the name “Seamonster,” and I think he does a wonderful job of incorporating his beliefs into his work without it being overbearing or annoying. For most adults who grew up in that kind of Christian context, it would be a long journey into making non-proselytizing art like yours. How did you come to a place of making nuanced art that explores questions, rather than preachy movies about platitudes and conversions — or, worse, movies made as a reaction against a religious upbringing? I don’t know. This feels more like a compliment than a question and I will happily just accept it. Since your central characters are both wrestling with the idea of faith — and specifically, Christian faith — I have to assume that’s a big subject for you. Have you struggled to relate to Christians the way that Travis does, like someone on the outside who doesn’t really relate? Or do you feel closer to Martin — someone who has a complicated history with the church, but who hasn’t given up believing? I don’t think I struggle to relate to Christians — I’m actually fascinated by them and a little envious in ways that are similar to Travis. I struggle with the belief. Travis’ line, “I feel like it should mean nothing or everything but I can’t get to either place,” is exactly how I feel about it. I can’t completely turn my back on the pillars of my childhood, but it just doesn't make enough sense to me at this point in my life to embrace. I’ve read that Martin Bonner’s story is based, in part, on your father’s experiences. What does he think of the film? He’s really proud of me and the film. If you were going to show this film to an audience in a double-feature with another film — something that explores similar questions, a sort of cinematic cousin to This Is Martin Bonner — what film would you choose? It’s a great question. Maybe Umberto D.? That was the one film I thought of immediately even before writing that would be good to aspire toward. Have you been surprised by any of the response to the film? What reactions or comments have meant the most to you? Very much so. I thought the film was, at best, going to be strictly for serious cinephiles, but average moviegoers all over the country have responded to it in a really meaningful way. Particularly older audiences, who I guess are starved for content that reflects their own lives in a relatable way. But also just people of all ages saying that they were moved by the kindness and optimism of the film, which are two aspects that I never gave a single thought to in the conception or execution. I didn’t realize those qualities were so rare in independent cinema. When someone says something like, “This film made me want to be a better person,” that’s pretty overwhelming. When you’re slaving away over it, you’re just hoping people don’t fall asleep when they watch it. Response is a magazine for thoughtful Christians worldwide, rooted in the people, life, and mission of Seattle Pacific University. The magazine explores the encounter between education, faith, and culture, and is an informed voice for Christian engagement in the world. Read features from our latest issue, sign up for a free subscription, and visit our archive of movie-related articles. Have you seen This Is Martin Bonner? Tell us what you thought, and read what others have to say on this moderated bulletin board.